Natalie Wood as a young Anna Muir. Recently widowed Lucy Muir is struggling with her bossy family. She decides to leave London and move to Cornwall with her young daughter Anna . Late one evening she meets the house ghost, an old grumpy sea captain called Daniel Gregg . As their friendship grows and her money dwindles, he persuades her to write a book about his seafaring life and it becomes a best-seller. One day she meets the charming scoundrel Miles Fairley and the captain sadly says goodbye to her before wiping the memory of him from her mind. However, Lucy discovers that Fairley isn’t really what he seems and the captain hasn’t really left her forever. A wonderful score by Bernard Hermann, full of soft gentleness and sweeping passion, perfectly complements this deeply romantic movie. Hollywood, as always, takes care of the romantic details, this time the setting a romantic cliff top cottage ( albeit not a hugging cliff in Cornwall but one in California, which was more budget friendly). In Tierney’s hands the lovely Lucy’s assertiveness grows until she is a woman of feisty resolve. Harrison never lets the captain become sugary, however, he does play captain Gregg at full stretch throughout which might seem over the top to some viewers. 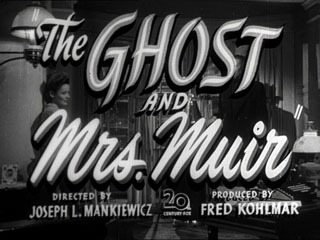 One of the joys of The Ghost and Mrs Muir is that there are plenty of surprises along the way- including a really romantic ending.